I had a yen for some Chai the other day, but with the heat, I would prefer iced. Iced is easier to make with a syrup or concentrate. Tazo makes a nice concentrate, but it’s a little pricey and I already had all the ingredients. I also had this crazy idea to making some really intense syrup and churning it in the Kitchen Aid ice cream attachment with some heavy cream to make Masala Chai ice cream. The syrup came out great and I’ll post later if it ever makes it to the ice cream stage. Leave on very low heat for about 3-5 min and then remove from heat. Let it cool for about 10-15 min and strain into a container to keep in the fridge. Makes about a half gallon. Stir the syrup before pouring because of settling. 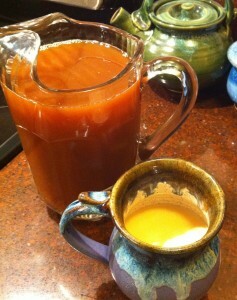 Pour into a cup with milk and/or half & half with about 1 part syrup to 2 parts milk. Serve iced or heated in the microwave. If you don’t have a pressure cooker, then boil the first step for about 30 min, but you may need to add extra water because some of the water will evaporate in the boiling process. This entry was posted on Thursday, August 5th, 2010 at 2:26 am	and is filed under Pressure Cooking. You can follow any responses to this entry through the RSS 2.0 feed. Both comments and pings are currently closed.